My casual look for Church yesterday--Now onto tackling this cold, Monday morning! Have a lovely day & thanks for reading! Gorgeous look darling ! Love the color´s combo ! Gorgeous Combination! I adore those pumps! i love burgundy and emerald green together! so pretty! I love bright colors in general, so of course I love this look! Your blue high heels are great shoes to go with the rest of the outfit, too! I love all the colors you've mixed here! I love the colors you chose here...they all compliment each other so well. Pretty! I love this look - especially your peplum top and the mix of colors! I love the peplum top! So cute! What a cute classic outfit! Loving this, especially the blue suede shoes :) Looking lovely as always! Love those colors together! Hope your Monday is going well! LOVE all the colors. These are my favorite kinds of fall outfits - full of coordinated but not matching colors. What a gorgeous color combination - love all those rich jewel tones for fall! Love that top and those suede shoes. I've been dying to check out the topshop via nordstroms stuff! I love the combination of colors in this, and your background scenery is so pretty! I agree with Lily! Love the color combo!! Love the color blocking! You look great! I love the color of your deep blue heels! 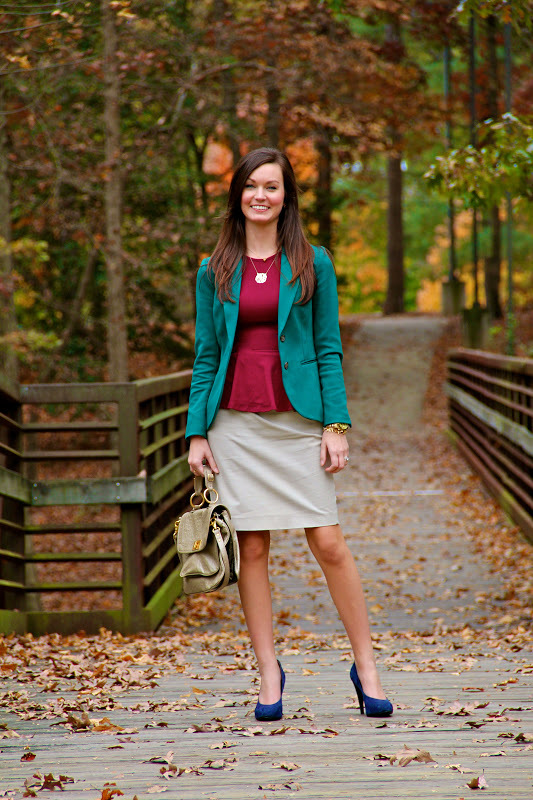 Jewel tones are perfect for Fall & Winter! just found your blog today!! love the outfit! especially the shoes! Love all the colors in this outfit! I wouldn't have thought about putting them all together but it works! And by the way, you are a stunner!! Really really beautiful and those shoes of yours are killer! How gorgeous are you?! I love the color combo of this outfit! I'm also really loving peplum! Thanks for stopping by my blog! I've been searching for navy pumps since, I don't know, basically forever - these are flawless. The whole look is fantastic, love the colors together. I love love love the mix of colors in this looK! I love these rich berry hues here - and of course the peplum! love the mix of colors in this outfit! like your style dear, how would you like to follow each other on GFC & Bloglovin dear? Love all of these jewel toned colors! 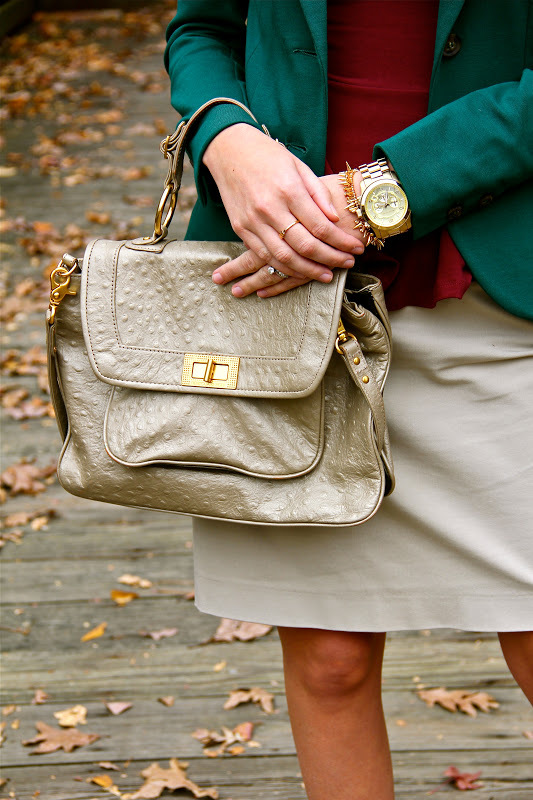 Perfect, classy outfit for Fall! Love your watch and you look soooo feminine!!! go girl!! Bold colors are my kind of colors! Love the look! Love the mixing of colors. They all work so perfectly together. Also, that bag is stunning! I'm loving the oxblood and teal together! The colors look fab on you! What a wonderful outfit! I really love this color combination! Nice colour combo in this look! Great outfit. 2 great colors that compliment themselves beautifully.